It doesn’t matter how old you are or what your background is –everyone’s getting tattoos now,” said Maria Acevedo, an artist at Iris Tattoo. The inky artistry of tattoos has become one of the sincerest forms of self-expression. Spontaneous or not, getting a tattoo requires at least a little thought. 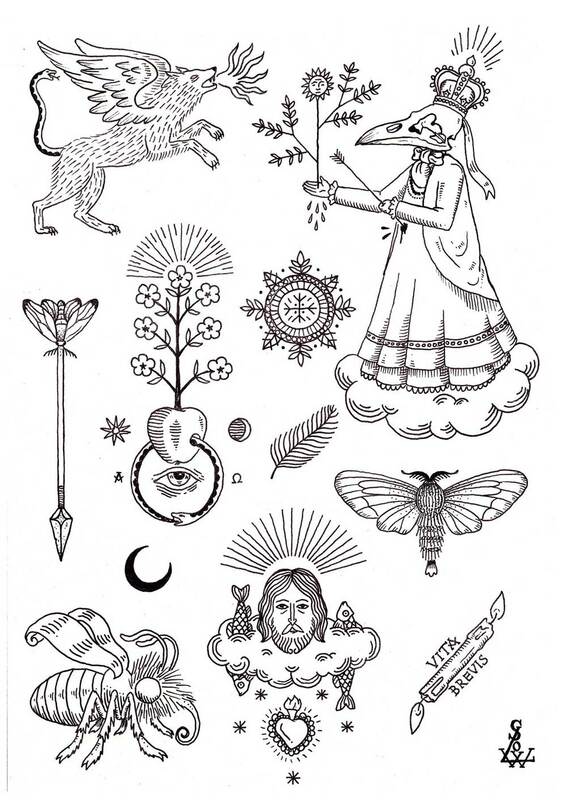 You won’t make it very far in the tattoo parlor if you haven’t chosen your ideal style first. There are dozens of styles to choose from, but some of the most common are illustrative, realistic, watercolor, tribal and traditional. Our best piece of advice: make Pinterest and Instagram your best friends. Social media platforms are often the best ways to get a taste of the styles of tattoos out there, what you’re in to and what you can visualize being inked on your body. Pinterest is the easiest way to create a “board” of all your favorite styles and designs. Because there is such a variety in styles, many artists focus on their favorite. Acevedo, who has been tattooing for just over a decade, was inspired to become a tattoo artist when she became a mother. Drawn to the arts her whole life, Acevedo decided it was time to find a steady job, as opposed to waitressing and bartending gigs, before she had her son. This is when she found tattooing, which allows her to work creatively every day and show her son the importance of pursuing creative passions, even if it is not along the typical career path. When she started working at Iris, her co-workers encouraged her to pursue styles she was passionate about, rather than being asked to create designs she wasn’t personally drawn to. Since then Acevedo’s art has evolved from big and colorful to simplistic, modern and geometric. Also passionate about self-expression, Acevedo said that tattoos “mean that I can do whatever the f*** I want with my body.” She continued, emphasizing that tattoos are not necessarily representative of a shady background or jail time. As trends change, the negative stigmas around tattoos have begun crumbling. Watercolor tattoos, in particular, have seen a surge in popularity in recent years. This new trend is exactly what it sounds like; artists have mastered the precision of ink to create the appearance of watercolor on skin. “The representation I wanted was something bright and pretty,” said Sarah Ruttenberg, a senior at the University of Miami, who opted for a watercolor design. Every color of the rainbow is delicately placed, yet they seem to move fluidly throughout the tattoo, showing her pride in her LGBTQ identity. At the moment, Ruttenberg has two watercolor tattoos but is interested in looking into other, simpler styles, as well. Selecting an artistic style is a huge step in the right direction, but you shouldn’t downplay the importance of color. Simply put, some styles pair better with the traditional all-black look, while some are best complemented by bold, vivid colors. Before landing on your favorite electric blue or bubblegum pink, determine whether the color is right for your skin tone. Bright colors pop on pale skin, but keep in mind that colored ink is more expensive and has the possibility of fading. Medium skin tones take to darker colors, but don’t pair well with yellow and orange tones. Dark skin tones generally opt for black or red ink, as both create the most striking contrast. As a general rule of thumb, it’s always a good idea to consult a tattoo professional to figure out what colors will work for you. “I have enough tattoos to the point where it’s part of my style,” said Nicole Bozkurt, a freshman at the University of Miami who has five tattoos. Two of her most unique tattoos are on her wrists: a mountain on one and a wave on the other, which connect seamlessly and beautifully when her wrists are put together. These tattoos, Bozkurt said, started with the idea of balance in life. Though she went to Pinterest for her initial inspiration, she likes to let the tattoo artist run with the idea so that his or her own creativity may unfold. Ultimately, she and the artist worked together to come up with the design that she now loves. Bozkurt went to Inkaholik Tattoos, a parlor in Miami that has become popular among students. For our tattoo virgins, however, Iris Tattoo is a safe bet if you’re even a little intimidated by the traditional-looking parlor. Located in Wynwood, Iris is “big on customer service and making you feel welcomed and comfortable,” said Acevedo, one of the in-shop artists. One of the best things about Iris, though, is that its website features the extensive portfolios of its staff, allowing customers to match their desired style with the right artist. Regardless of where you go, the best thing to do is research, research, research. Instagram is a great source of inspiration, as well as a place to examine each artist’s specific work. Every tattoo artist has their own styles and specialties, so don’t hesitate to stalk their page and make sure you like what you see. When you finally find yourself in the chair next to the artist, be sure you are ready and, most importantly, excited to have this piece of art on your body forever. words_kathryn ford. photo_ gianna sanchez & noah vesey. design_olivia stauber.